Milky Way Grand Hotel. Draft Race Airway. “Say the words, say the words: Six words, six words! Say the words, say the words: Six words, six words!” Doesn’t sound like a dream. Sounds like millions shouting it. Inside his red battlejet, he wiped the sleep from his eyes. Where did they put me this time? He sat up in his pilot seat, and viewed a long, air-enclosed raceway. The blue, partly cloudy atmosphere of the airway led straight into a billowing vortex that reminded him of a hurricane. No planets or moons in sight, just an ocean of glimmering stars. This must be the draft race. Thousands of white grandstands hovered along the airway’s sidelines, where millions repeated the six words: “Win the race! Save your planet!” Rev heard them, but he couldn’t stop staring at the ever so slowly spinning vortex at the raceway’s end. A hundred battlejets could fly into it, and he had no idea what obstacles lurked within its battle worlds. Rev wasn’t yet twenty-one, and this was his first official race. There was so much he didn’t know. Maybe someone else from Earth should be sitting here. He looked to his left and to his right. Thirty battlejets hovered at the starting line, every one of them from a different planet. He let out a nervous, pent-up mouthful of air. It’s the draft race. All you have to do is finish. Get past the firepower and obstacles. Qualify for Grand Battle. Don’t get distracted. Just get ready. The wavy blue lines decorating the sleek armor of his battlejet resembled tiny clouds. The battlejet’s hypersonic engine could propel him in any direction; its particle acceleration sensors glowed briefly. The cockpit instrument console lit up, with railgun and laser cannon systems switching on. The aircraft’s retractable wings extended and pivoted back, then all power faded and the cockpit looked as lifeless as before. I didn’t touch anything. Was that a systems check? He tried adjusting his wing tips and rudder, but his controls didn’t respond. Squeezing and then relaxing his grip on the triangular handles of the steering column calmed his trembling hands and racing heart. Shadows of air taxis crossed his cockpit, causing Rev to look over his shoulder. Embedded in the blue atmosphere, the Milky Way Grand Hotel floated against a backdrop of stars. The hotel resembled a flower garden. Thousands of ladybug air taxis flitted about skyscraper-sized stems and spiraling vine escalators. Elevators shaped like caterpillars crawled up and down, transporting guests to the hotel rooms within each stem. Thrashing drums shook Rev’s blue and white cockpit panels. Gigantic drummers sat on a circular aircraft that floated steadily down the blue airway toward his battle jet. “The drummers were wounded and scarred creatures. Many wore tilted, tarnished crowns, black capes, and matching plates of armor. Shards of wood splintered off pounding drumsticks the size of small trees. Large air notes displayed Drummers from Peace and Made in Sakari. Between the grandstands, flying neon cameras flashed light on carnival mega-carriers and festive starliners. Joyous racing fans bounced to a rhythmic, bass-heavy beat. Media screens pulsated, offering drinks, used spaceships, and a vacation on planet Sakari. Rev’s knee nudged a frayed cloth tool belt that dangled from his steering column. He recalled the night Sashi had given him the tools; tender memories and a feeling deeper than he had ever known before flowed through him. He lifted the tattered tool belt onto his lap, wondering if he’d ever see her again. The two white hands on the face of his timepiece lit up; the hands floated on a black dial that rippled like water. The tools inside his tool belt powered up, and all his cockpit controls and airscreens flickered on. A panel burst open and a translucent smartball dashed about the cockpit. The smartball was the size of a handball and was filled with colorful, complex data streams. “TST!” Rev laughed, delighted to see his friend looking as good as new. Rev wore a hearable, a tiny in-ear device. Since Rev preferred to both see and hear what TST communicated, the smartball displayed what it spoke. Rev moved swiftly, expanding three airscreens and adhering to a pre-scripted ignition checklist. He pressed the start button and his hypersonic hopper engine roared to life. Rev released a long, deep breath to settle his nerves, but disrupting his calmness were thirty battlejets powering up with engines that sounded as big and obnoxious as his own. He stared into the vortex, and for a few moments he stopped trembling. Just a draft race. Just a draft race. Just a draft race. Amid the roaring of engines, opposing battlejet pilots readied firepower that could destroy his aircraft. Rev tightened his grip on the steering column as brawny railguns, plasma cannons, and multiple air-to-air missile launch systems sprang to life. Dodge their firepower, and you won’t die. When this race starts, finish it. Finish this race. Star Racer is the winner of the National Silver Medal for Best Science Fiction at the 2016 IPPY Book Awards. Kirkus Review: "A fun and fast-paced space opera...A rich, complex universe that immediately captivates the reader...the novel manages to feel fresh and compelling, with an incisive wit and an imaginative eye...Accompanied by original chapter illustrations, the book offers a universe to which readers will surely wish to return." Author Martin Felando hired four artists to create over 100 pages of full-page art. Go to @starracersnovel on IG to discover a lot of cool book art and videos. Veteran artist Gordon Studer played a leading role in the book cover design and created over 20 original sci-fi icons. His art was recently showcased in the WSJ and the NYTimes. Artists Gordon Studer, Piotr Foksowicz from Poland, JC Park from South Korea (over 1M views on his ArtStation page), and Zheng Wei Gu from Singapore (19 years old with nearly 100K followers on IG) pack the novel with so many full-page illustrations and artwork that the reading experience is similar to a graphic novel. Blurb: In the year 3834, inexperienced racing sponsor Sashi Oon and rookie battlejet pilot Rev Arden must win a dangerous obstacle race to save an endangered Earth. 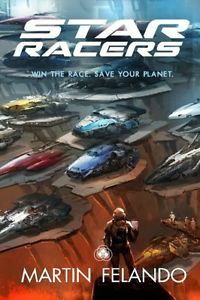 Star Racers was eight years in the making, and edited by Jon Harrison, editor of over 20 books.